US VS THEM this Invasion Day! 3 bands and 3 DJ’s are set to joust it out in a huge day of genre crossing mayhem! Featuring DJ’s from the acclaimed Dank Morass and White Rhino crews and some hot up&coming local bands, this is one shindig you don’t want to miss..
With an OZ BBQ, home-made pies and mad drink specials all day long, leave your your wading pool in the cupboard and get some breeze on The Balcony- 153 Elizabeth Street in the City. 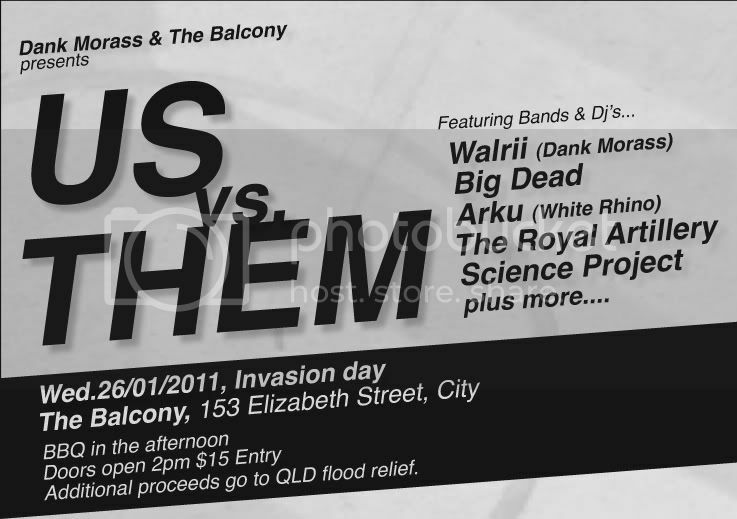 Be at the exciting new venue, The Balcony on Australia Day for a relaxing afternoon and electric evening complimented by Brisbane’s finest bands and DJ’s covering sounds to please any ears!